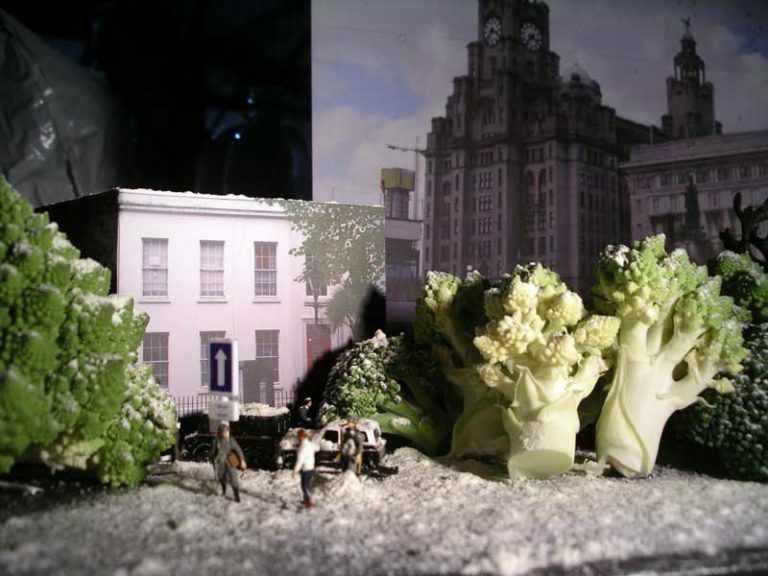 Urban voodoo is a project, in which we created a physical model of Liverpool and how it might exist in the memories and imaginations of those who have lived and worked in it. Our idea was to treat the city not just as a place to live, but as a living object. We sought to show the city not how urban planners and corporations saw it but to capture the sort of stories that bring a place to life and differentiate it from other places. The idea originally stemmed from our work Me the City, dealing with similar themes. 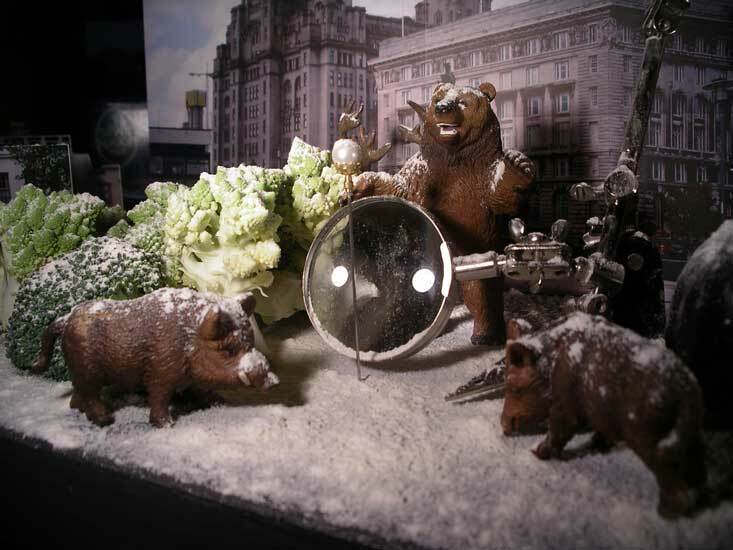 From questionairres and several interviews, we wanted to get to know specific places where events had taken place and to tease out the psychogeography of Liverpool. These specific places could have included the you had your first kiss, went to your first gig or the street corner you broke up with your first love. We then videoed, photographed and modelled these areas, mixing between video footage and the model in the final performance. These issues are especially pertinent to Liverpool as it goes through the massive redevelopment of its shopping centre. It is a city complicated by the need to catch up with the changes that have affected other English cities in the past few decades. Because the stated theme of Liverpool Biennial 2006 was 'Archipuncture', we decided to consider the city as a body and to find out where the heart, head, soul and inevitably, arse of Liverpool are. Our approach was to talk to or canvass as many people as possible in the short timescale. We distributed questionaiire cards in various venues and also made specific appointments and interviews for a more in-depth approach as well. In the four days leading up to the performance we received about 40 responses to the questionnaires, talked to students studying in Liverpool and interviewed three people in depth about growing up and living in the area. These meetings with people generated stories of different lengths that we then re-told during the performance, placing them in the model, animating this with the live camera feed and mixing with the pre-shot video footage. After each story we performed a simple voodoo rite, marking the locations of these events on a map with hat pins and responding to the specific story: to rid a pub of ever having a spiked drink again or to mark the point of forgiveness as a policeman let a budding musician off a serious offence. 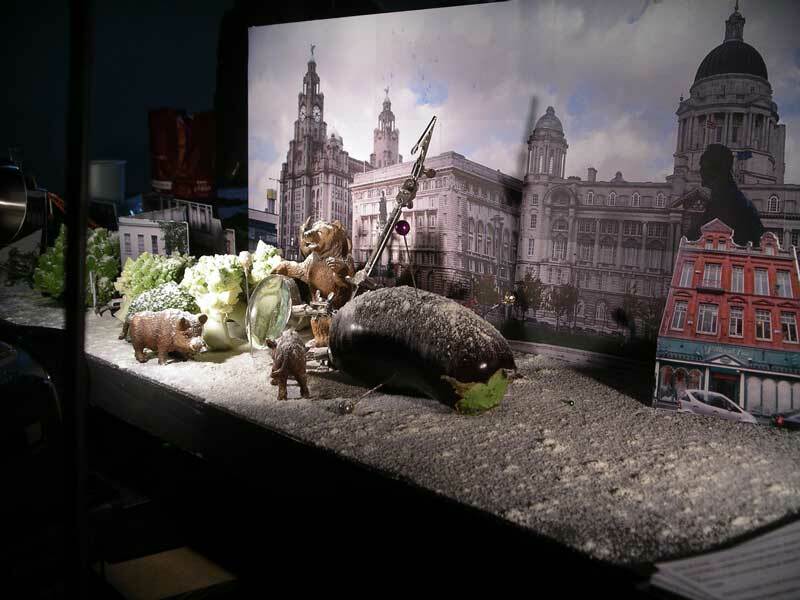 During the performance, the tabletop landscape of Liverpool was transformed by the re-telling of these stories; an architecture of the imagination was created and as we tracked back along the model at the end of the performance, grass had grown down Bond Street, impossible conjunctions of Liverpool Buildings had been created, the city had once again become the natural habitat of forest creatures and snow fell in a warm October. It was our intention that for a small moment - the time that it took to perform Urban Voodoo - those witnessing the performance could perceive Liverpool differently, a city made up of human interaction, not just the hard materials of concrete and brick. We have a simple, unedited, fixed camera documentation of the performance available on DVD. Please contact us if interested in receiving one, stating whether you are an individual or acquiring it for an institution. You can download the full text of the performance here [35kB pdf]. It was formatted to be printed out on record cards that we used during the show as prompts.